Our client was just 13 years old when he was critically injured in a devastating boating accident while on a trip to visit family in Minnesota in 2012. The boy was swimming in a lake in front of his family’s property while a family member was driving a boat nearby. Tragically, the driver of the boat lost sight of the boy and struck him, which left our client with serious and life-threatening injuries. The propellor of the boat struck our client in the leg, resulting in several lacerations that were extremely deep and exposed tendons, muscle, and bones in the leg. In addition to the deep lacerations to his feet and legs, the boy suffered a broken femur, broken pelvis, dislocated hip, and broken shin bones. The county sheriff’s office received a 911 call about a minor child who had been injured in a boating accident. When officers arrived at the scene, Emergency Medical Services responders were providing medical treatment to the boy and trying to stabilize him for medical evacuation. The boy was airlifted to a nearby hospital trauma unit where he was treated for his injuries. 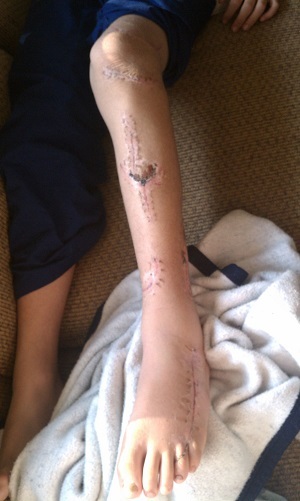 He underwent an emergency surgical procedure to repair the extensive damage that was done to his leg. Although the doctors were able to patch up the injuries, the boy and his family understood that he had a long road of recovery ahead. After the surgery, he returned to Washington state to recover from his injuries at home with the assistance of his family. Due to the nature and severity of the injuries to his leg, the boy began an intensive physical therapy program at a local hospital in Seattle. Even after 18 months of rehabilitation, however, the boy still had trouble with regular movements, particularly over longer distances. He was unable to participate in popular activities for average 13-year-old boys – the leg injuries made it difficult for him to run, bike, jump, and go hiking with his family. The lacerations were so severe that the boy was left with significant and noticeable scarring, even after undergoing an intensive reconstructive surgical procedure. He was eventually advised to consult with a plastic surgeon for possible scar revision surgery. After the boy was released from surgery and began his rehabilitation program, his parents began to realize how serious the accident was and how his injuries could potentially affect his future. Less than six months after the accident occurred, the boy’s parents called Davis Law Group to discuss their legal options. After nearly two years of tracking the boy’s recovery and dealing with insurance adjusters on the family’s behalf, the insurance company agreed that it was in their best interests to settle the claim ahead of a scheduled trial. In the end, attorney Chris Davis and the legal team at Davis Law Group were able to successfully negotiate a $1,300,000 settlement on behalf of the boy and his family. We recovered a $1.3 million settlement on behalf of the family of a boy who was struck by a boat propeller and suffered life-threatening injuries. The family hired Davis Law Group a few months after the accident occurred.